Spectacular views of Atlantic Ocean and coastline from condo on top floor of five-story building. Experience the breathtaking views from private double balcony as well as inside living spaces. Our unit is located in Building A, Myrtle Beach Resort, just steps to the beach and oceanside pool and with Lazy River located at west end of building. The condo (1000 sq.ft.) has been renovated with flooring and carpeting replaced throughout, kitchen opened up to living room with ceramic tile bar, updated kitchen and appliances, ceiling fans in L.R and bedrooms. Replaced sliding glass doors and interior doors, bathroom vanities/fixtures in both bathrooms. 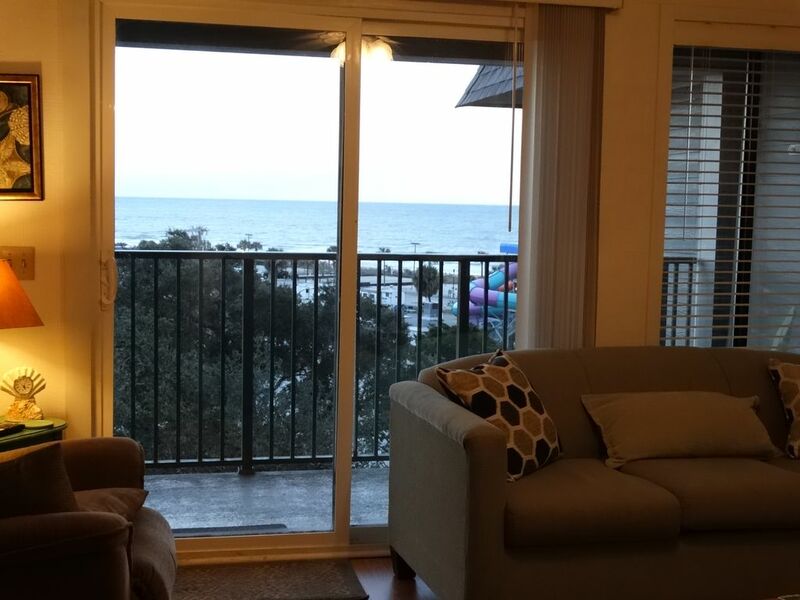 The unit is tastefully decorated in a beach theme, featuring a double balcony off living/dining room. The master bedroom has a queen-size bed, twin beds in second bedroom, queen sleeper-sofa in living room with Lazy Boy recliner. Fully equipped kitchen has hardwood floors, ceramic tile bar and up-to-date appliances. HD TV's in both bedrooms and living room. Myrtle Beach Resort is a 33 acre family resort featuring 24 hour security with guard station at entrance. Six swimming pools (two indoor),375 ft. Lazy River and Wet Deck with Kiddie Pool, Jacuzzis, two exercise rooms with saunas, as well as basketball, bocce ball and tennis courts provided for your enjoyment. Convenient enclosed playground for small children plus snack bars/restaurants inside resort area. Open viewing decks are located just a few doors down from our condo, with beautiful views of Atlantic Ocean, great for sunbathing or just relaxing. Laundry room located just down the hall on same floor. Plenty of food and entertainment for whole family without leaving the resort and the beach just steps from building! Great shopping and restaurants just minutes away including nearby outlet malls. Short drive to premier golf courses and the popular Murrells Inlet restaurants and Marsh Walk. Convenient location for Broadway at the Beach, Coastal Grand Mall, Legends, airport, etc. Entertainment featured for the whole family at cabana bar on the beach in the resort during peak season. Enjoy all the conveniences of home with the amenities that only a first-class resort can offer. Wireless internet is available for your convenience. Rates include bed/bath linens, departure clean-up and parking pass. Pets are NOT allowed. NON-SMOKING UNIT. Saturday to Saturday rentals during summer season. This condo is managed by the owner and we do our very best to provide our guests with a great vacation experience. This was our second stay in this condo and we loved it. The location, distance to the beach/pools, and the view are all perfect. The condo is clean and roomy enough for 5 of us. The owners were very responsive to messages. The condo had everything we needed for a great vacation. Bath towels, beach chairs, toys, and umbrella, and linens were provided. Walmart is conveniently across the street so we were able to pick up anything we forgot. The resort is clean and very family friendly- the lazy river pool area is great for kids. I recommend bringing laundry detergent; the washer and dryer are right down the hall. You’ll also need to bring beach towels. We absolutely love this condo and will certainly be back. Thank you Glen and Maxine! Thanks so much for your wonderful review. We are so glad you enjoyed the condo and all the amenities of the resort. We do our best to provide our guests with the conveniences of home away from home. The resort is very family oriented and has so much to offer guests of all ages. The Lazy River is great for kids of any age and is only one of the many amenities that are a favorite of both kids and grown-ups. We were so pleased to have you and your family back again and hope to have you visit again next summer. We spent 2 week and it was wonderful. Thanks so much for your review. We are so glad you enjoyed your stay at our condo and were able to take advantages of all the resort has to offer. We hope to have you back again next year. Thanks for being such great guests!! We loved staying there. Convenient to everything. We enjoyed staying in your two bedroom condo compared to staying in a regular room at a hotel. We will definitely do it again. Thanks so much for your review. We are so glad you enjoyed your stay and look forward to having you back again. The resort has so much to offer and as you mentioned, is convenient to everything. Thanks again! Thanks so much for your review! We are so glad that you enjoyed your stay and hope to have you back again as our guest. The location of the resort is so convenient to many of the top attractions and great restaurants in the area, with so many ammenities offered at the resort. Thanks again! Our trip was fantastic. Contacting with Glenn and Maxine was easy; they had quick responses every time. We received all of our necessary check in information well ahead of time. The condo was comfortable, even for 2 adults and 3 kids. The condo was up to date, and was well taken care of. The view was beautiful. Everything was better than described in the property post. We were highly impressed. We would love to return next year, if they will have us. Our only complaint was the difficulty finding parking, even with handicap placards for our son. ... But we still loved it! Thanks so much for your review. We are thrilled to hear that you had a great vacation and enjoyed the resort and our condo. We agree, the view is beautiful and if you are an early riser, the sunrises are spectacular! We strive to make the condo as comfortable as possible for our guests and the resort provides so many amenities, its difficult to get the kids to leave. Extra parking is usually available in the areas just a short distance from the building if none is available at the building. Thanks again and hope to see you next summer. Great condo, top floor was the best! The condo came equipped with everything you need for a beach vacation! Bring your own beach towels! Only negative was it needed more bath towels and dish towels in the kitchen! The location wasn't near restaurants and entertainment, but right by the beach and pool! We are so glad you and your family enjoyed your stay at our condo and the resort. We are sorry that you did not find the number of bath/kitchen linens adequate, however we offer the standard issue for 6 people that most condos provide in that area. We hope you and your family were able to visit the Quarterdeck located on site, which serves a wide variety of food & drink, music and fun for the whole family. The Galley also located on site serves breakfast, lunch & dinner, not to mention the snack bars located at the Lazy River and pools. There are numerous restaurants on Business 17 within a couple of miles, with Murrells Inlet just 6 miles away. Broadway at the Beach, the Boardwalk & Promenade are only a few miles north of the resort. Myrtle Beach Resort has much to offer with the advantage of being near some of the top attractions in the area. Rate includes departure cleaning, linens and parking pass. RATE DOES NOT INCLUDE 12% SC SALES TAX. Saturday to Saturday rentals only during summer season. This condo is managed by the owner and we strive to provide our guests with a great vacation experience.